Sri Lanka depicts a tiny dot in the map of the world. Three major exporting commodities, Rubber, Tea and Coconut once placed this tiny speck in the world map to earn her foreign exchange and became known among overseas traders and importers. Of late, the English gentleman’s game of cricket placed Sri Lanka on the plinth of popularity. The on-going terrorist war has made its name filter through mass media to every nook and corner of the world. Athletes like Susanthika Jayasinghe, followed by various other sports men and women at international level have made the name Sri Lanka reverberate on international billboards and television screens. Yet, how many are fully knowledgeable about the great treasures buried under this amazing island’s own chattels? Although many have been talking about Sri Lankan precious stones on the British Crown, not sparing the late ‘Princess Diana’s expensive Blue Sapphire from Sri Lanka’, yet not many have made any serious attempts, for too long, to explain or educate the international community at large about the prevalent gemming industry in Sri Lanka and the craftsmen’s skills available here to cut and polish such regal jewels to radiate majestically. Leave alone the foreigners and international markets, how many people in Sri Lanka itself are aware that nearly three quarters of our land is blessed with gems buried in 46 proposed identification locations spread right across the country? A country’s progress is directly proportional to its strategic economic and development plans with positive and long term policies. What are the ingredients required for a country to be economically and financially advanced? As much as a good foundation is needed to build a solid house, grassroots policies of a country should be to identify and recognise the inherent treasures and develop such genius into national industries. Simultaneously, it will be important to maintain an open-eye attitude on foreign and International market forces too. Combination of these two factors in this economic equation and balancing out the act will not only create wealth, employment opportunities but will open doors for more innovative and new ideas and local industries alike. 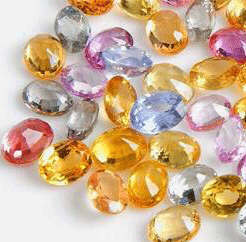 In this regard Sri Lanka’s national gem and jewellery industry would be a good topic for discussion. The late Dr. N.M. Perea initiated the State Gem Corporation in 1971. By 1993 there existed a need to implement strategies and policies for the development of the Gem and Jewellery industry under Act No. 50 of 1993. On 1st March 1993, therefore, The State Gem Corporation ceased to exist and transformed the industry into a new agency under the National Gem and Jewellery Authority (NGJA). For a long period of time this national asset remained a ‘dead duck’ with nothing spectacular in terms of utilizing one of Sri Lanka’s national treasures, but confining to a somewhat lethargic semi-government operation. President Mahinda Rajapasksa, with his sound economic policies, created the ideal environment for this industry to grow into new heights by opening up new avenues and relaxing many an obstacle which previously hindered the progress of the industry. NGJA’s new schemes include ECommerce facility through its own website – www.srilankagemautho.com enabling traders to transact online. Steps were taken to initiate training programmes in Thailand as per a MoU singed between the NGJA and the Thai Jewellery Manufacturers Association; highest sponsorship package offered towards FACETS in 2007, currently they are in the process of finalizing details with the SLGIA on the proposed Gem Testing Laboratory to be established in collaboration with the private sector; Have initiated steps to establish a ‘Gem Museum’ at the premises of the National Museum in Colombo; Established a ‘ Round the Clock’ export facilitation unit at the Air Cargo Village at Katunayake; implemented a scheme to reimburse 75% of the cost of Training programmes conducted by the Gem & Jewellery Institute and intend to extend this facility to Gem and Jewellery Research & Training Institute; awarded student scholarships for family members engaged in the Gem and Jewellery Industry and have taken steps to train 7000 gem miners on safe and productive methods of gem mining, in order to upgrade their skills and promote the industry progressively. NGJA policy to relax the stringent restrictions at the airport which virtually throttled all opportunities of importing gems to the country with no more ‘leave at Customs and clear later’ regulations but with ‘immediate clearance’ facilities along with a reduction of the 30% import tax to a bare minimum of 3% made the industry boom and bring positive results during the 2nd half of 2007. This generated a highest export figures for the first time out of the gemming and Jewellery with maximum profits since 1971. The National Gem and Jewellery Authority statistics in the second half of 2007 reveal export revenue of Rs.51.9 billion which is a 16% growth rate over its previous year’s figure of Rs. 44.9 billion. Similarly, gem exports had increased to Rs.10.4 billion, a 6% increase than the amount reported in 2006. Even more significant has been the rise in jewellery exports which has recorded Rs. 2.89 billion, a 17% increase than in 2006. Diamond exports have earned Rs. 37.77 billion recording a staggering increase up to 19% over the Rs.31.7 billion in 2006. In line with the latest policies adopted by the Gem and Jewellery Authority any new venture with a minimum investment of at least Rs. 50 million with export orders not less than 80% of output will qualify to a three year tax holiday and corporate tax for 2 years at a 10% and 20% thereafter. Further concessions granted to the industry is the exemption of duty and Value Added Tax (VAT) under Sri Lanka regulations on all imports of precious metals and gems including diamonds. Liberalising of such policies were mainly focused with the prime objectives of making Sri Lanka a cynosure for manufacturing, trading and retailing of gems, precious metals and jewellery. With effect from 1 January 2007 Port and Airport Development Levy (PAL) also has been removed on gems, diamonds and gold. The latest research by the Gem and Jewellery Research and Training Institute show 46 ‘proposed identified’ sites of gem deposits in Sri Lanka. Distribution of gem minerals spread from Mihintale down to Ridiyagama down south embracing Kantale, Lunugala, Getahatta, Eheliyagoda, Kuruwita, Hatton, Maskeliya, Moneragala, Okkampitiya, Kiriella, Bulathsinghala, Ratnapura Pelmadulla, Balangoda, Agalawatta, Akarella, Nivithigala, Rakwana, Kalawana, Deniyaya, Embilipitiya, Kataragama, Elpitiya, Meetiyagoda, Morawaka, Ridiyagama, and Akuressa. Recent gem deposits found by the GJRTI include Naula, Bakamuna, Elahera, Attaragallewa, Kaluganga, Hattota Amuna, Ballapana, Galapitamada and Akarella. There is a great opportunity for Sri Lanka to prosper in the future if correct polices are revised and continued to utilize gems buried in the above mentioned sites. In certain circles some believe that Sri Lanka has already lost a great deal of wealth buried under the Mahaweli project, with no access or hope in the future. Similarly Kothmale and Moragahakanda sites have become a hot potato these days with the environmentalists, planters, government ministers and the Gem Authority engaged in a policy making tug of war! Moragahakanda too is identified as a source full of the most expensive gems in the world, but its future will ultimately depend on an executive decision by President Rajapaksa alone. Meanwhile widely spread rumours keep on buzzing within the gemming circles about some hidden agendas in certain quarters to shut down this budding Gem and Jewellery Authority, which has begun to show profits, and to hand it over to the private sector on a plattter which some believe may include Thailand, in the name of liberalising the industry. If such rumours are to be taken seriously and have any ground, one could only assume that it would be the final nail on the NGJA coffin at a time when the industry has just started to boom with new policies, modern techniques, specialised training facilities (with safe methods of mining), welfare insurance packages and incentives to miners. One cannot expect private entrepreneurs to be highly disciplined unlike in a government controlled organisation of this nature when, for obvious reasons the very people are allowed to dabble in gemming and trading! If such an unfortunate chain of events were to take place in the future, critics prophesise that the NHJA is going to lose about 40% income generated by them at present. It is also stated that around 6000 Sri Lankans working in Thailand in the gem trade at present are using illegal means to smuggle out Sri Lanka’s precious stones in most devious means, even under stringent government controls at present. Should such an environment become inevitable, then it is suggested that gemming should not be restricted to only a chosen few but free to all, while making the NHJA as custodians with certain amount of powers to monitor. Advanced countries in Asia such as Malaysia and India are good examples for Sri Lanka to emulate. Their national policies being to recognise the local product, local industries and local manufacturers have successfully paved the way towards industrial expansion and helped them to build up a sound economy and become profound foreign Exchange earners simultaneously. If Sri Lanka is seriously thinking of attaining an advanced and progressive state, like her neighbours, Malaysia or India, then petty politics of every kind, bickering and resentments need to be shed aside for self esteem, egotistical reasons or personal gains and be united and national minded. With the abundance of national treasures buried under, in the form of gems, and not yet being fully explored, the Gem and Jewellery Authority with its proven record, within a very short period of time, not only can produce employment opportunities in the future but will certainly help to narrow or close the gaping fiscal gaps which are visible at present in the country’s national budget. With the latest customer service facilities introduced at NGJA headquarters with one-stop-shop facility under a single roof with valuations, access to courier companies and post office facilities at finger tips, an exporter is today able to send out his consignments within one hour. Similarly the same facilities are available at the NGJA offices at Katunanayake airport cargo terminal on a round the clock, 24 hours service basis. In its endeavors to promote the industry, the National Gem and Jewellery Authority "NGJA" has made arrangements to organize "Sri Lanka Pavilion’s" at eight major gem and Jewellery shows in 2008.